Quite often vehicles are involved in accidents and with more extensive mechanical problems require assistance reaching our facility. Penn Automotive will gladly tow or flatbed your vehicle in for repair. Our courteous drivers (often the owner) are experienced and will safety and securely transport your vehicle. We offer towing 24/7 365 days a year. If you require immediate assistance outside of our normal business hours please call us @ (412) 461-7500 and select the option for after-hours towing. When you are in an accident please be very aware about tow trucks that rush to the scene of the accident. Many wil promise to bring the car to the place of your choosing, but instead will bring the car to their own facility. 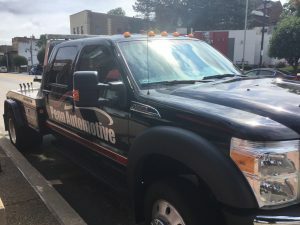 These towing companies will often charge outrageous fees (sometimes in the thousands of dollars) for a tow and storage fees. In almost all cases, the car will not be released until the amount is paid in full. If we are not available to tow your car, the next best option is to call the city tow pound, McGann and Chester at (412) 381-9400.